When your legs explode and arms go numb, you’ve arrived on the Koppenberg, a Flemish climb that has reduced pro bike racers to shuffling, broken survivors. For years, photographs have carried forward stories of the suffering on the Koppenberg and nearby hills that exact a toll during races in March and April. The plot: Men in trouble, faces blank, eyes searching for an escape from pain as the race leader floats over a summit toward immortality. We can’t stop watching. Words to describe the cobbled bergs of Flanders don’t come easy. The vicious, ramps would be considered insane in America if introduced today as part of any professional race. In Belgium, however, they are established ties to the sport, alternatively spiritual and demonic, unique places where champions reveal themselves and club cyclists try to sample history without falling over. As common as wheat beer and frite stands, the climbs are part of life in Flanders. When I asked a young team racer near Ninove, Belgium, if he enjoyed riding on cobbles, he looked at me like I was confused. None of the Flanders climbs are long enough to inflict upon riders an extended type of suffering that a Ventoux or L’Alpe d’Huez can. But what these hills lack in distance is made up in both the hard racing pace of the Belgian Classics and surface variety. It’s here that cobbles aren’t just cobbles. They’re quasi-weapons hiding in plain sight: square, rectangular, triangular, uneven and sometimes sharply pointed in stretches that have been “repaired” and preserved. Add to this mix the individual topography of each climb, and you’re at a disadvantage of any success until you’ve ascended each one at least two or three times to start to learn their personalities: The Molenberg’s crowned center wants you to straddle either side and go in the big ring if possible; the Oude Kwaremont’s large-gapped stones and deep crevices jackhammer you for 2.2 km until you can barely stand it; the Paterberg’s near-immediate tilt to 20% delivers an uppercut punch to the throat and hammer blows to the quadriceps; the Muur van Geraardsbergen’s tree-shrouded tunnel presents what can only be described as large horizontal razor blades impersonating rocks. The Muur’s most difficult section greets you before you make a right-hand turn and then ascend a gradual left-hand sweeper up past a chapel where each Spring beer-soaked cycling fans crouch down, clench their fists and scream encouragement. 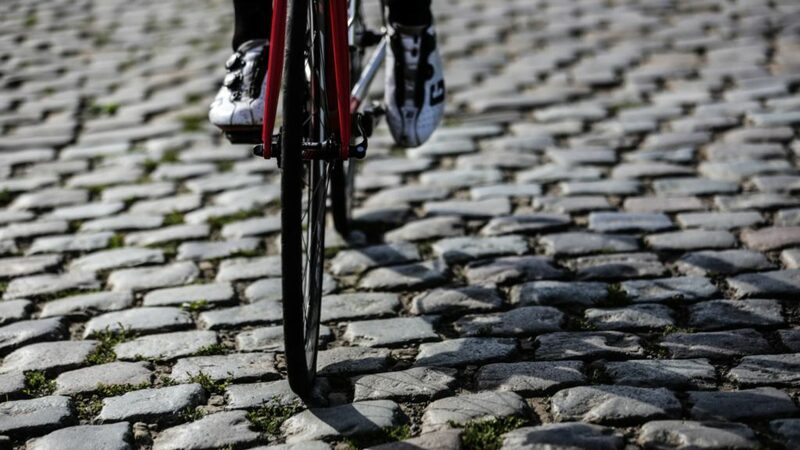 Climbing the cobbles in Belgium cannot be duplicated. The first time up a legendary berg, you swear under your breath that someone is grabbing your wheels, pulling your bike downward. The second time up, you’re convinced it’s true. It has to be. The amount of rattling, jarring and jerking transmitted on TV screens is not remotely close to real life at 185 heartbeats per minute. Staying composed on the bike is as vital as transferring watts and picking the right line. Thoughts of easily conquering Flemish cobbled climbs are more like hopes of remaining upright, of selecting the proper gear, of remembering as much around you as you can. Forever.